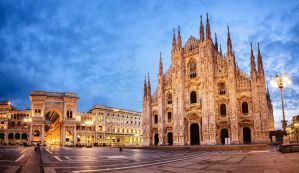 Milan is at the financial heart of Italy. It offers visitors a combination of old and new, with historic architecture surrounded by a cosmopolitan city. Many visitors rush through Milan, but for those who linger for a while, there are many hidden gems and entertaining activities. If you're traveling alone to Milan, there are many hostels that offers social atmospheres in a comfortable setting. You won't have to look far to find a fun place to stay. How much do hostels in Milan cost? Ostello Bello Grande is one of the most popular and well rated hostels in Milan. The staff that work there are travelers themselves, so they know what you're looking for in your home away from home. They also speak a range of languages including English, Spanish, French, Portuguese, Japanese, German and Slovenian. If you're traveling alone, then this hostel has a great set up for meeting other guests. The hostel is welcoming and friendly, without being a party hostel. There is a bar on site that many guests enjoy hanging out in and there are three open air terraces that have hammocks, vegetable gardens and a barbecue. If you want to relax inside, there's a tv lounge that also have video games, board games, pingpong and fussball. The hostel has a wide range of amenities that it offers to guests. There are dinners available which are a great opportunity to meet other guests. There's also a shared kitchen where you can prepare your own meals. Free city tours and travel information are also available. Dorms sleep between four and six guests and both female only and mixed rooms are available. Private singles and twin rooms are also available. The hostel is conveniently located near the Central Train Station and it is a twenty minute walk to the Duomo, with many attractions just a few minutes away. Madama Hostel and Bistrot is a great option for solo travelers in Milan. The hostel has shared rooms available that sleep either four or six people. Both mixed and female only rooms are available. Each room has air conditioning and a private bathroom, as well as small lockers. If you're looking for more privacy, then private rooms are available as well. The hostel is conveniently located just a few minutes walk from the underground station Lodi T.I.B.B. It's proximity to public transportation means that most of the city's main attractions are accessible with just a short trip. The building itself is actually an old police station inside a liberty building. It's well furnished with lots of light. Amenities available to guests include breakfast, travel information, and wireless internet. It's a pleasant place to stay during your time in Milan. Hostel Colours is a great option for independent travelers who want an affordable and fun place to stay. The hostel is modern and well furnished. It's conveniently located near the subway green line M2 Lambrate FS Station. This is just four stops away from Milan Central Station and not far from the city's historical center. The hostel has four, six, eight, ten and twelve bed dorms and there are female only, male only, and mixed rooms available. There is an additional charge for air conditioning and towels, but breakfast is available. The staff is wonderful and can help you with all kinds of travel information. They keep the place clean and welcoming, so if you're traveling alone, or even if you're not, you will likely enjoy the atmosphere. Lumiere Hostel is a pleasant place to stay with a relaxed atmosphere. It's a great option for solo travelers and is popular with young backpackers, but it is not uncommon for families or small groups to stay here as well. The hostel is located in a French style villa outside of the city center. It's very close to a metro station so transportation is accessible and convenient. The neighborhood is quiet and pleasant, so if you're looking for a good night's sleep, then this is a good option. The rooms are quite comfortable and many have balconies. There are also common areas where you can relax in front of the tv or with a good book. There's a shared kitchen available to guests who wish to prepare their own meals. If you're traveling on a tight budget, then this is a convenient and comfortable place to stay. The hostel is clean and the staff are very helpful.